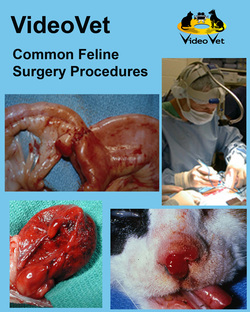 This DVD includes procedures that will be performed during the NAVC wet lab course titled ‘Common Feline Surgery Procedures’. Procedures include nasal planum resection, a perineal approach to feline perineal urethrostomy, feline perineal urethrostomy with the cat in dorsal recumbancy, chest drain placement in a cat using a feeding tube and trocar technique, diaphragmatic hernia repair, techniques used for visceral organ biopsy, subtotal colectomy and ventral bulla osteotomy. NOTE: This DVD and the Common Canine Surgery Procedures DVD can be purchased as a 2-DVD Combo.